Yesterday was spent masking things, sanding, painting, etc. I didn't take any pictures just because there wasn't much to see. 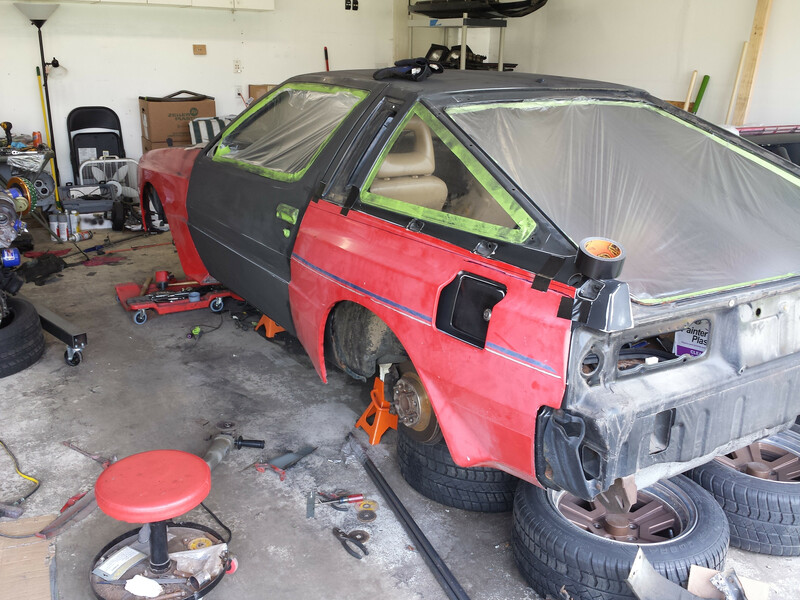 Today I'll be doing a bit of rust repair, working on modifying the front fenders, and starting to make the front end assembly. Derek and I went to a local place called DiscountSteel and I picked up lots of aluminum sheet for both the ducting and the exducer vent. Also just over 40ft of 3/4 cold rolled 16g pipe. I'll update as I go. Alright, lots of pictures coming your way. 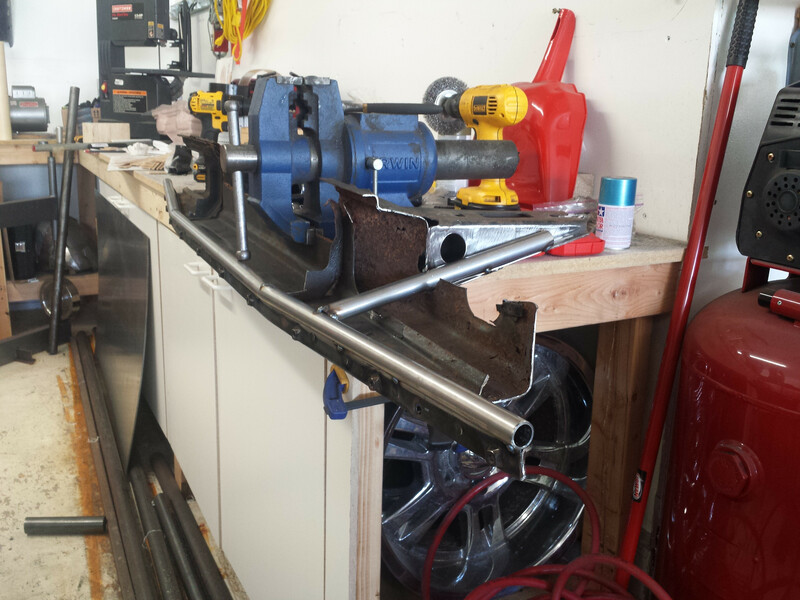 I feel like I didn't get a ton accomplished today but I guess fabrication work takes time and lots of thought. I spend a few collective hours just sitting in front of this thing thinking about how best to go about it. Here is where I got as of 30 minutes ago. 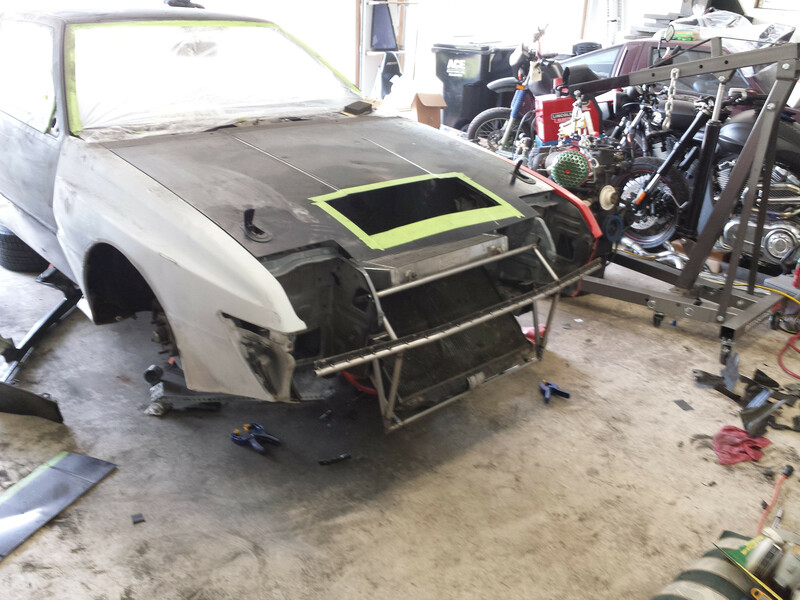 Tomorrow morning Derek and I will go get some more welding gas then I will be adding the mounting for the intercooler, making the hood vents and ducting, and then I hope to god we will actually get to cutting out the rear quarters and making the over fenders. 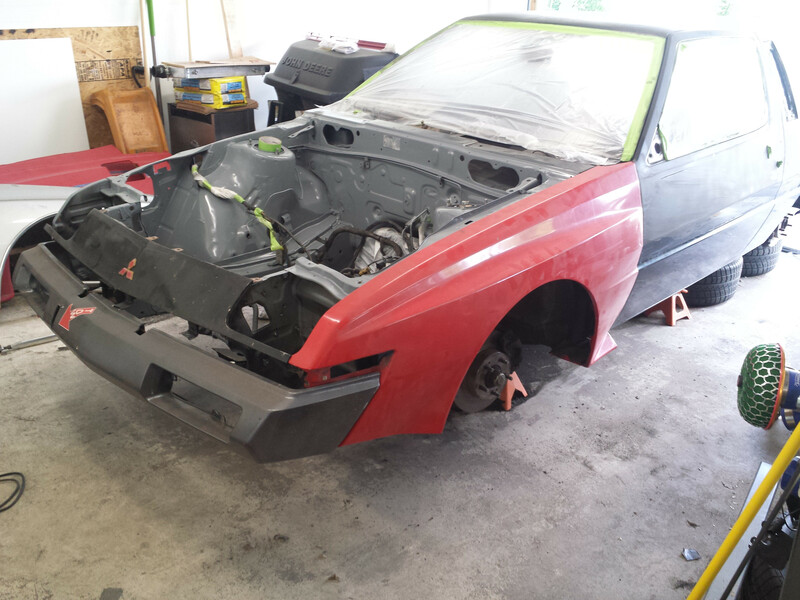 I need to have this thing painted friday night if I have any hope to drive it home sunday. 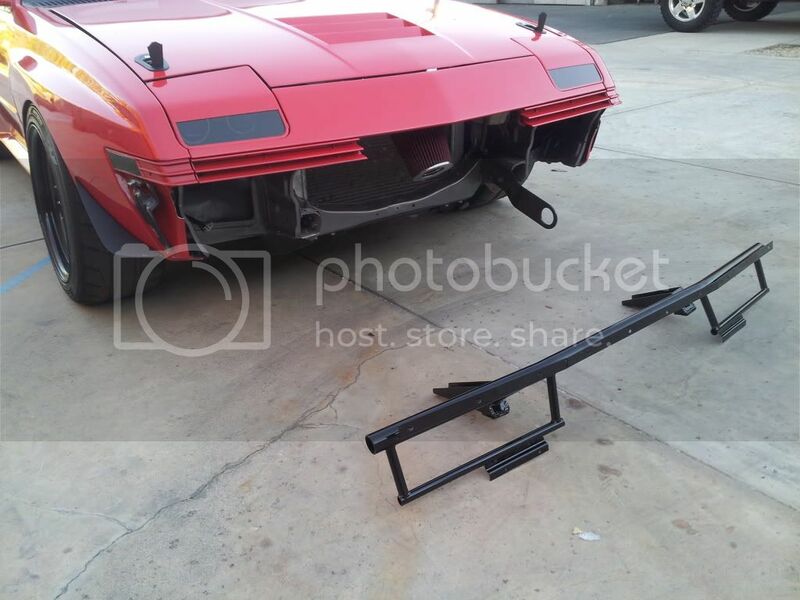 I knew that if I was to have any hope at all of having the bumper and everything else line up correctly Id have to atleast use the front bumper support as a base. So here is what i did. It worked well. And here it is right after making it but before cutting it down further to add to it. 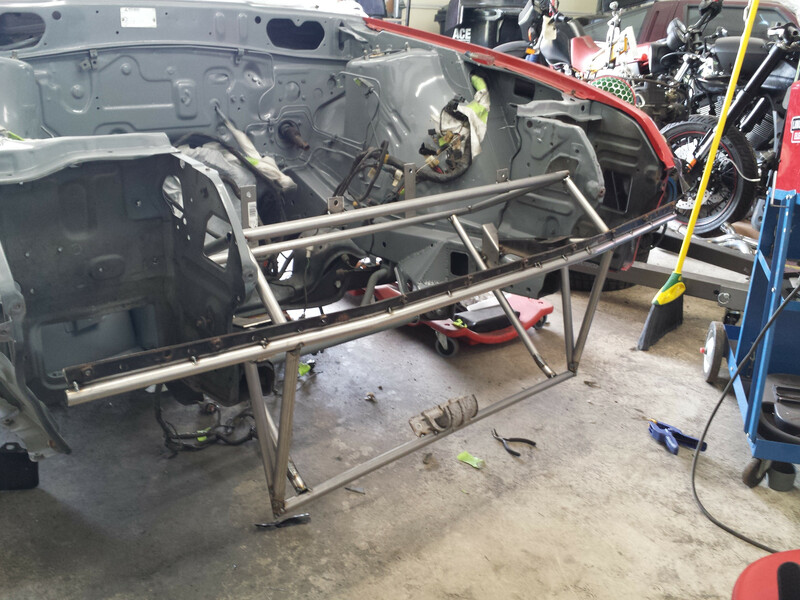 On to adding the radiator supports. 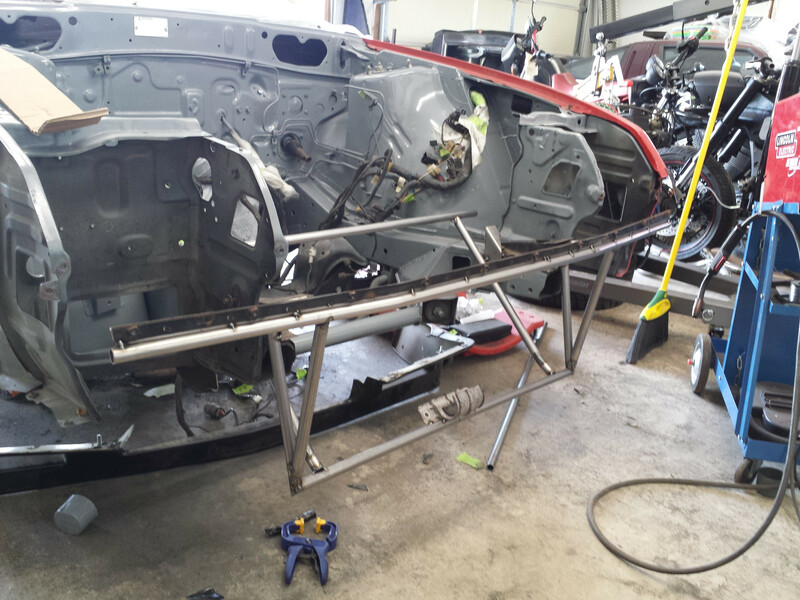 Adding structure and setting things up to be able to add the intercooler section above. 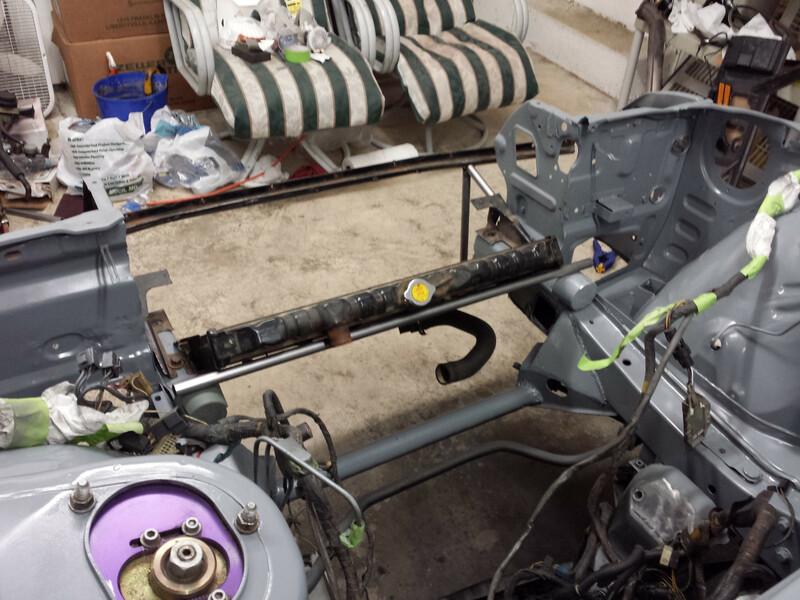 Well I am out working on the car again and the radiator mounts are done. I just need to drill the holes for the top mounting bolts. I can do that later. As you may have guessed I'm behind lol. 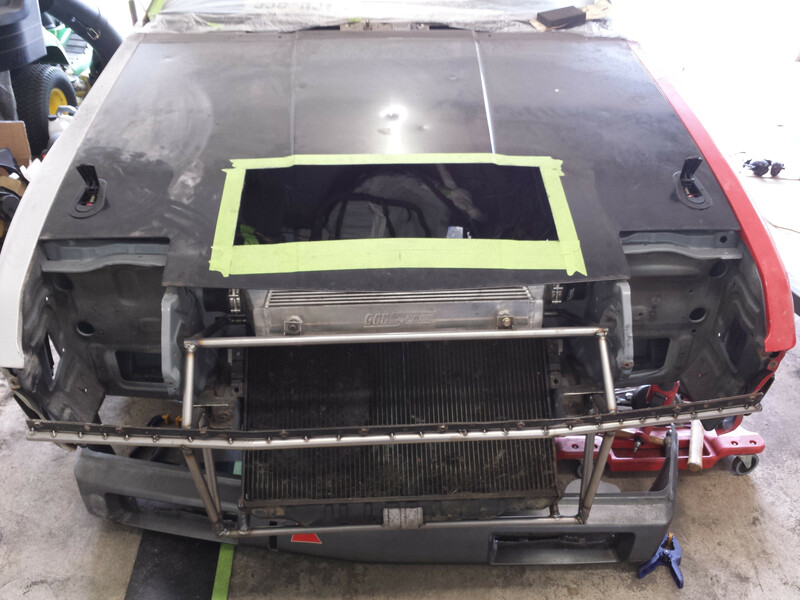 On to the intercooler. is that a fatty fender on a flatty!? Some flatty lovers may be cringing. It is cheesy. The flatty will soon no longer be flat lol. Looking really good man. I really hope you have more plans for something that will provide protection in a crash. That tubing is way way too small. I've stopped for the night, anything I need to do requires tools that make tons of noise. Since Derek lives out in suburban hell I can't make noise past dark which is about 9pm. I spent another hour or so sanding more of the car down but kind of hit a stand still. I'm tired and want to sleep. 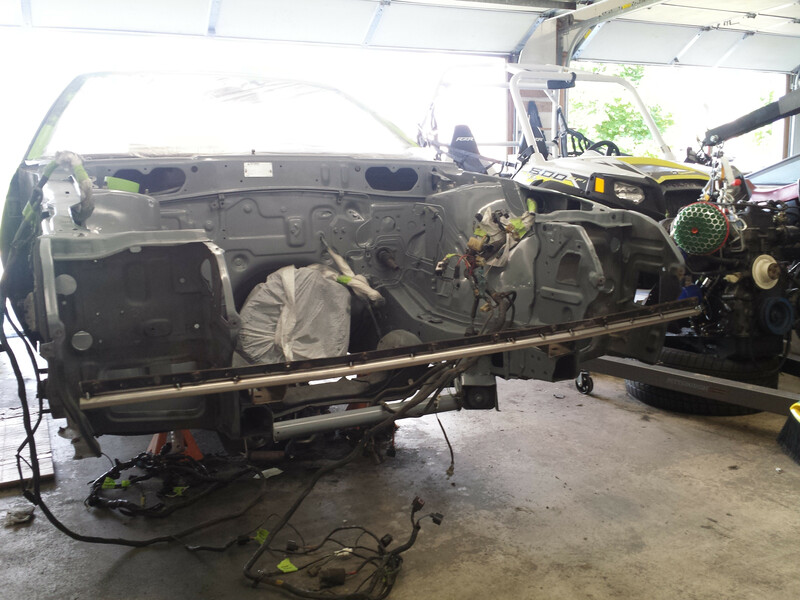 I plan on waking up at 7am again and getting this pig ready for paint. 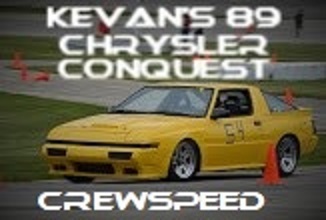 Convette, I understand what your saying and to be honest I mentioned that to Derek a few days ago about how this thing would be no hindrance at all. This is my first time building anything like this let alone fabricating or welding to this degree. Any and all suggestions are more than welcome. 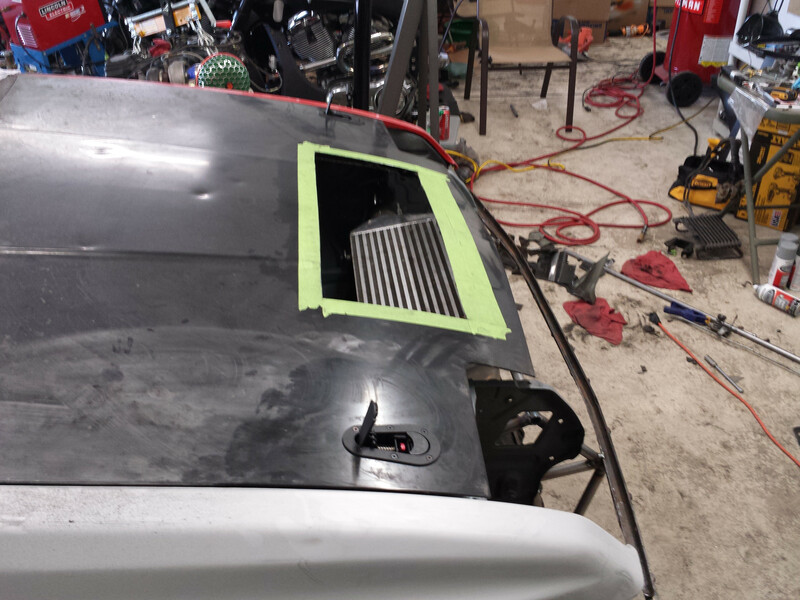 I finished a lot today including making hood pin plates, cutting the hood for the vent, finishing welding up the front assembly and putting it on the car with the radiator and intercooler, and also sanding etc. I will leave you with this picture and post more in the morning so you can see how far I got. 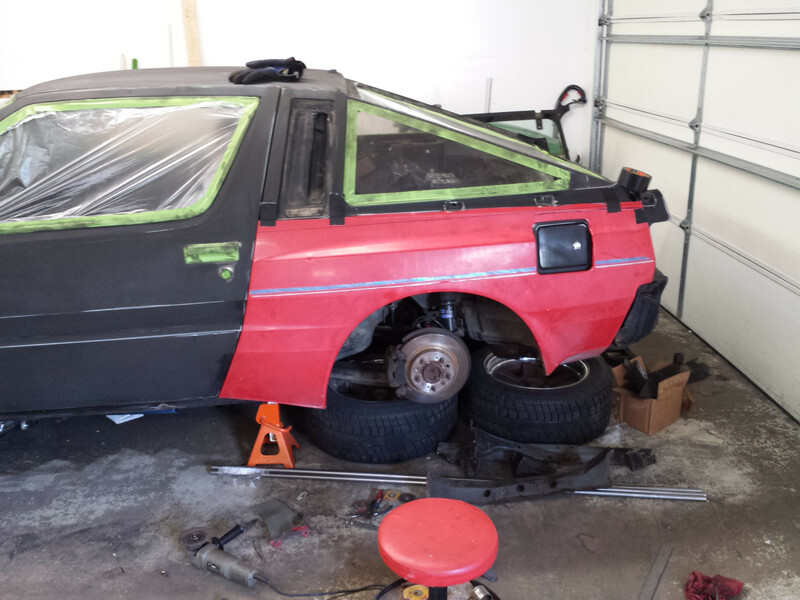 Tomorrow night I very seriously hope to paint the car.... thats wishful thinking though I believe. I may take one more day off of work. U going to fit that air dam under that? Edited by dukaine, 10 July 2014 - 11:28 PM. 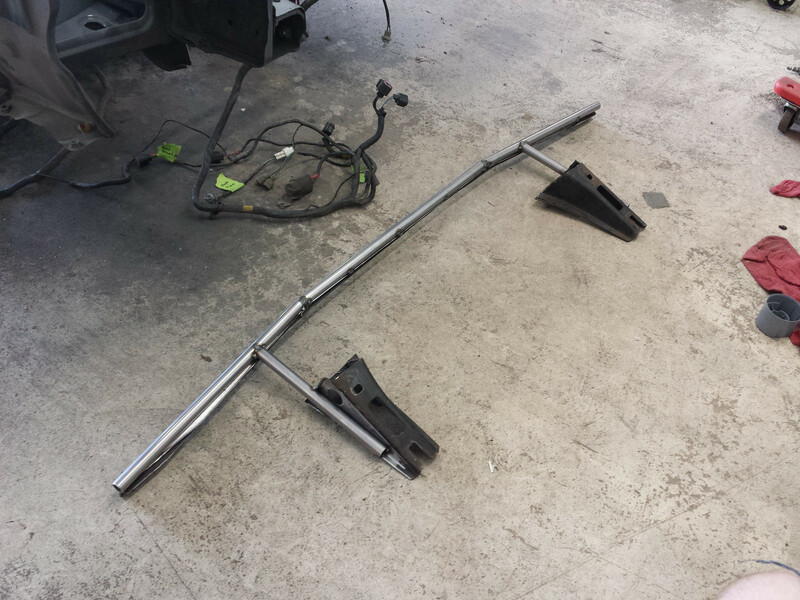 Looks so low, when the car is on the ground, will you be worried about scraping? Looks good Allen! It is good to see your car love applied to your flatty. @Technology - Its just an illusion from the poor picture angle. Its level with the bottom of the cross member. I took care to ensure it wasn't an issue. The air dam would hit before it would. I know your pretty far into it now, and at this point might need to be something you come back to, but just as a heads up. Very curious to see the hood work out ect. Great work so far, most importantly your learning. I appreciate the heads up mbruneax haha. And thanks for looking out converts. I hear what your saying and your right. I am super far and can't redo it and hope to finish but I'll definitely need to build another one. Besides my welds are ugly, structural but geez they are ugly lol. I'll have a huge update tonight. Oh I do mbruneaux lol. Well its the end of Friday... the idea was to have the car painted by now. As you might guess its not. 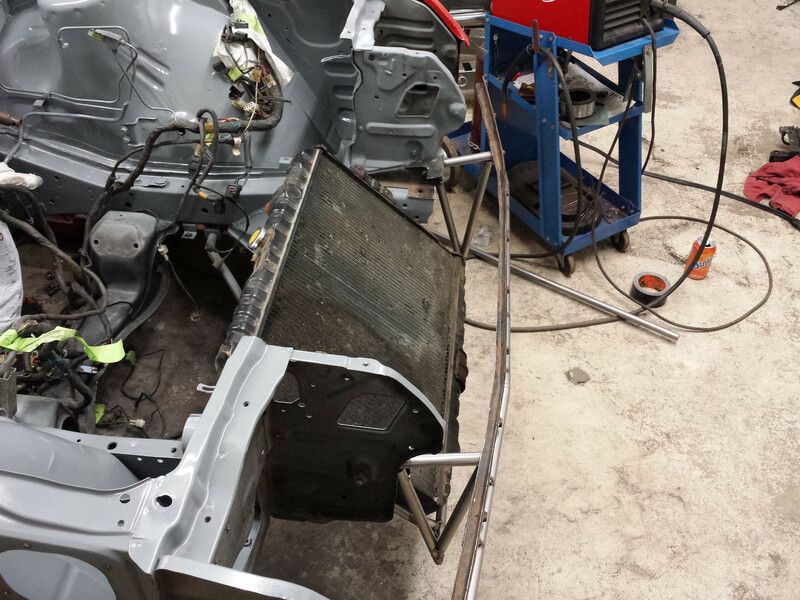 I did the rest of the fabrication for the hood and also the rear over-fenders. 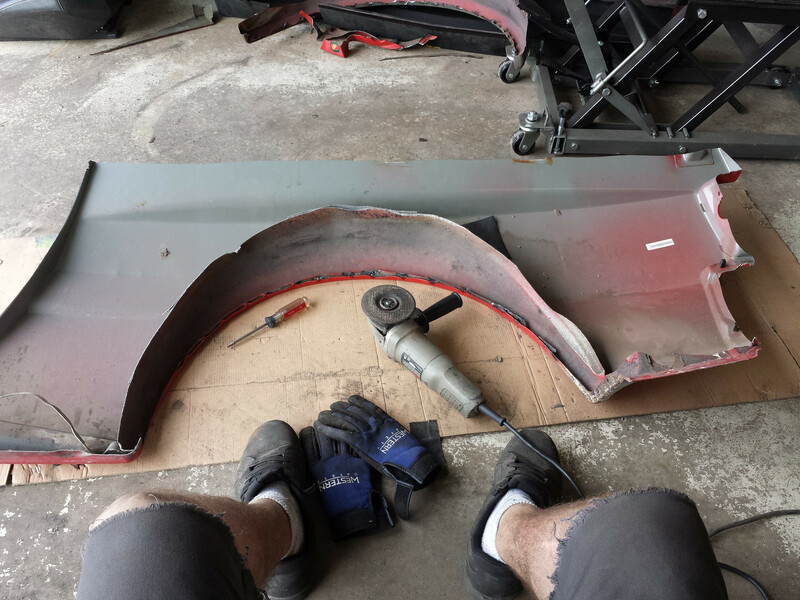 I also sanded the hood down and started thinking about what to do with the quarter panel and fender sections that meet the door sill side skirt. I will be deleting them to give a more coke bottle shape to the car. 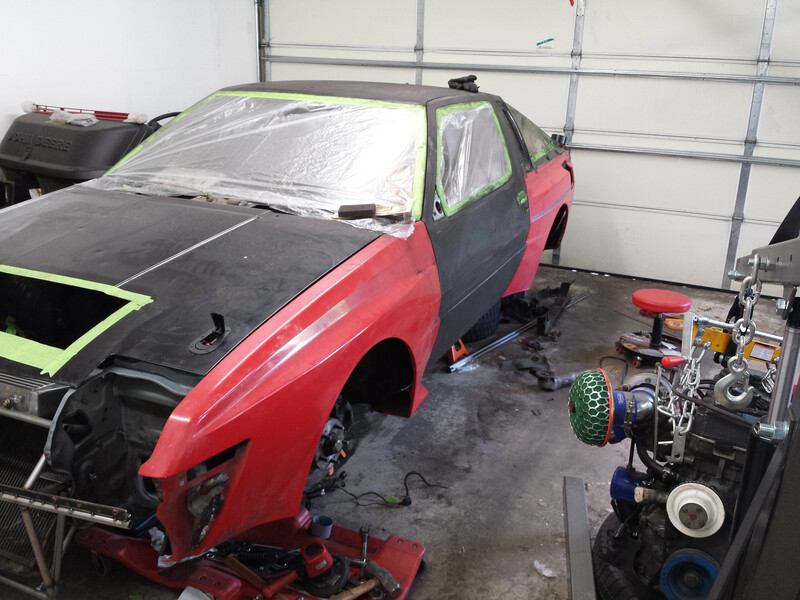 My hope is that tomorrow I can finalize what I will do to delete those, do a bit of bondo work, prime the car and let it dry, sand it down with 400 grit sand paper, build the temp paint booth in dereks garage, and... well spray the car and panels. Its going to be a lot of work but... I hope I can finish it. 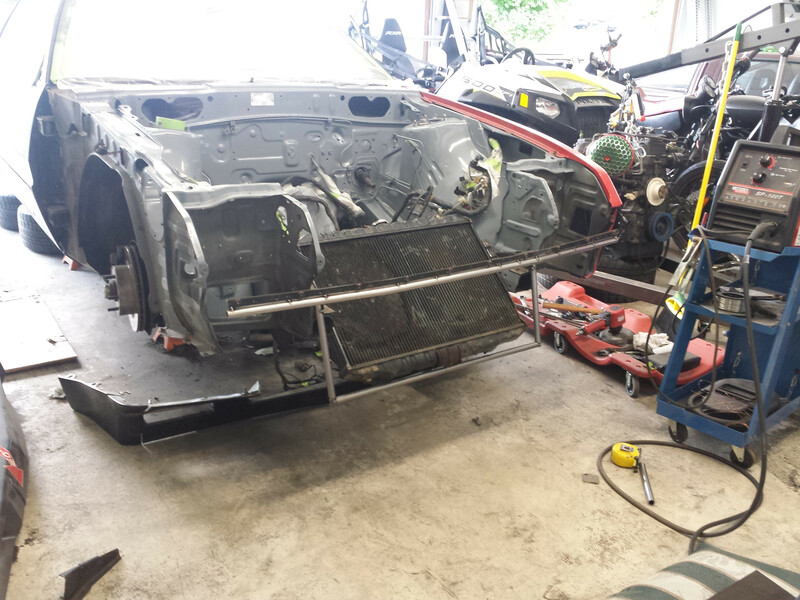 The car will need time to dry before I can put the body stuff back together and drive it home. After giving it a day to dry I'll start putting the engine back in and the rest of the stuff I tore out. On to what I did today!